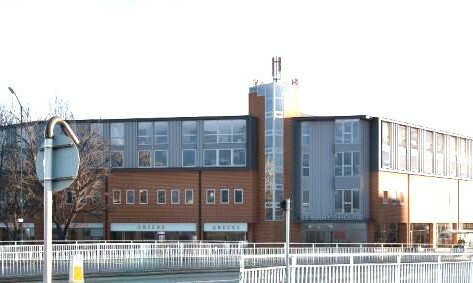 Providing market-leading luxury student accommodation in Sheffield, Crown House has a range of modern, high-quality student apartments in an ideal location – just 8 minutes’ walk from Sheffield University and 10 minutes’ walk from Sheffield Hallam University. Whatever you need from your luxury student accommodation, Crown House can accommodate you – our range of studios and apartments includes a number of different options for size and furnishings, and even includes full one- and two-bedroom apartments. All our rooms include an en-suite with shower, and they all have access to our inclusive ultra-fast 300mb/s wi-fi. They all also include a fully-fitted kitchen space, including an oven, hob, fridge/freezer and breakfast bar. Your comfort and security are assured by our 24-hour concierge service, and we have a range of exclusive, high-quality on-site services. A private cinema, dinner party room, games booths, study area, flexible lounge space, fitness suite and on-site events make sure you’ll never be bored. Crown House Sheffield’s prime location and high-spec apartments mean that they book up quickly – get in touch today to book an apartment before they’re all gone! 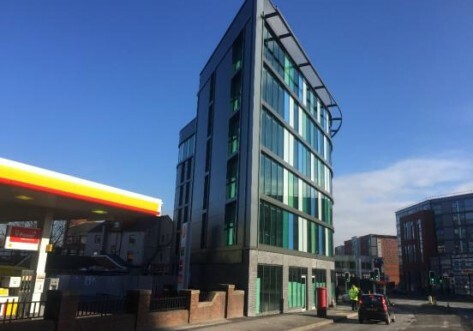 The latest in luxury student accommodation in Sheffield, each room in these apartments includes a 3/4 size bed, bedside table and 32” TV, wardrobe, drawers, a desk with desk chair and fitted USB ports, and a fully-fitted en-suite shower room. The apartment also features a high-quality shared kitchen with a 2 ring hob, refrigerator, freezer, combi oven and stylish breakfast bar. As well as this, you’ll have access to our exclusive features and amenities, including a private fitness suite, and on-site cinema, gaming booths, flexible lounge space, private dinner party room and 24-hour concierge service. 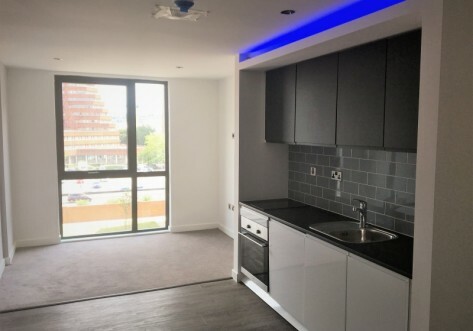 At 20m², these luxury student studio apartments come with a ¾ size bed, bedside table, desk with sockets, USB ports & chair, a wardrobe, drawers, a pin board, and a fitted kitchen area with combi oven, fridge/freezer and 2-ring hob. These studios also come equipped with a 32” TV, breakfast bar, and en-suite with shower, and have access to all our incredible exclusive amenities, like the cinema, games booths and private fitness suite! 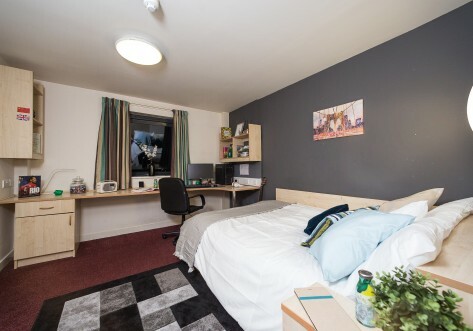 This spacious studio offers a double size bed, bedside table, wardrobe and drawers in a 27m² luxury student room, which also comes with a 32” TV, a desk with desk chair and USB ports, a pin board to keep you organised, and a large tub chair to relax in! Over at the kitchen area, you’ll find a combi oven, 2-ring hob, fridge/freezer and breakfast bar, and across the studio, a new, fully-fitted en-suite with shower. Don’t forget, that as a resident at Crown House, you also enjoy exclusive privileges like access to the private dinner party room, private cinema, fitness suite and gaming booths. Get in touch to book now – these rooms are filling up fast! A luxurious 32m² student apartment, this modern, stylish and spacious studio provides market-leading quality and comfort to our residents. With a double bed, bedside table, wardrobe & drawers, you have lots of storage space, while the kitchen is equipped with a combi oven, 2-ring hob, a fridge/freezer, a drawer dishwasher and a breakfast bar. Your living space is kitted out with a 2-seater sofa and a 32” TV, and the study space includes a desk with desk chair, USB ports and pin board. Finally, an en-suite with shower rounds out the studio, and you have access to all the great residents-only benefits at Crown House, like on-site events and a private cinema! The largest of our studio apartments, this 40m² luxury student flat includes all the amazing furnishings and benefits of the Prestige Studio, in an even more spacious and airy apartment. A luxury student apartment, this spacious and modern student accommodation comes equipped with all the highest-quality furnishings and fittings found in our Prestige Studios, including a private bathroom with shower. Of course, you also have access to our market-leading private facilities, like an exclusive cinema, private fitness suite, dinner party room and 24-hour concierge service.